As we all know, being overweight is just as serious as being underweight and this is no different in horses. Carrying excess weight puts extra strain on joints and ligaments as well the major organs. Obese horses and ponies are much more likely to develop conditions such as laminitis, insulin resistance and equine metabolic disorder. If you read our recent blog 'How to correctly condition body score your horse,' then hopefully you’ve had a chance to assess your horse’s weight and score him appropriately. If your horse is currently a condition score of 6 or above then you need to take action. The grass is growing fast and now is typically the time that horses gain weight, so if your horse is already carrying a bit extra, then he has the potential to pile on even more! Don’t let this happen - prevention is better than cure! In order for your horse to lose weight he needs to use up more energy (calories) than he is taking in from his hard feed and forage (hay/haylage and/or grass). If your horse only needs to lose a small amount of weight and to tone up then increasing his exercise alone may be enough. If, however, your horse needs to lose a substantial amount of weight then you will need to restrict his calorie intake and increase his work load (if possible). Increasing ridden work is not always possible especially if your horse is elderly, not yet backed or has a condition or lameness meaning he can’t be ridden. In these cases increasing turnout is a great way of naturally increasing a horse’s exercise. While this will mean he is exposed to more grass which isn't ideal, turnout on poor or restricted grazing, into a manege or sand/wood chip paddock or with a grazing muzzle, could be. If your horse does not have access to grass in the turnout areas then an alternative form of low calorie forage should be supplied. Put several piles out around the space to encourage your horse to burn calories by moving between the piles. Many horses in the UK can easily survive on forage-only diets, particularly if they get access to good quality grass or hay/haylage and still have enough energy to be ridden in light work. In fact some particularly energetic good-doers can even compete to a high level on a forage-only diet. Does your horse really does need the hard feed you are giving him? Contact a reputable feed company helpline for advice. Do you know the calorie level of your hay? Some hay and haylage can be very high in calories so it pays to get your forage analysed to ensure you are not providing unwanted calories. If your forage is high in energy you can soak it to reduce the amount before feeding. Do you know the weight of your horse? Weigh tapes can be acquired easily and used to give you an idea of how much your horse weighs so you can accurately work out how much to feed him. It is also a good guide for you to see if your diet is working! Use the weigh tape every week and at the same time of day to see if those pounds really are being shed. Once you know the weight of your horse you can work out how much feed he should be eating per day. For horses on diets it shouldn’t be more than 1.5% of his bodyweight, unless advised otherwise by your vet. If your horse is on a diet, it is likely that he is not getting the full quota of vitamins and minerals for a healthy balanced diet. It is therefore important that you feed a general purpose vitamin and mineral supplement such as NAF General Purpose Supplement or Dodson & Horrell Daily Vitamins & Minerals. If you are feeding poor quality protein then you may be better opting for a balancer rather than a vitamin and mineral supplement as it will provide protein in addition to the vitamins and minerals. Before you worry, protein is NOT the same as calories. There are specific balancers available for horses and ponies on weight loss diets such as Blue Chip Feed Balancer Lami-Light or Blue Chip Original Native Feed Balancer or Top Spec Lite Feed Balancer. If you have to keep your horse stabled for long periods of time then you will need to consider his mental health. Horses are designed to graze and forage for at least 17 hours per day and if they can't do this they can easily become depressed. 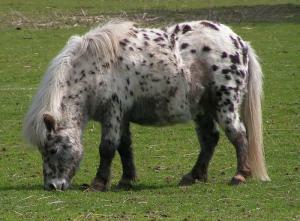 Some horses may show signs of stress by developing stereotypies such as box walking and wind sucking. You can attempt to combat this by giving them something to do or play with such as the Likit Boredom Breaker or a Stubbs Rock ‘N’ Roll Ball. Always ensure that any snacks or treats you feed are low calorie and invest in a horse safe mirror to give the impression that your horse has company. If you have any experiences you would like to share please feel free to comment below or email [email protected].